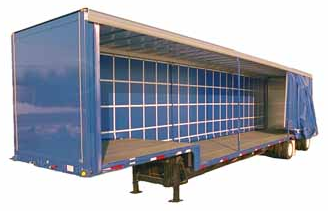 Your rugged steel curtainside sliding door trailer opens and closes in mere minutes, ready to load and unload, and eliminates traditional flatbed tarping with the ease of closing the curtains. The Quick Closure releases to allow the curtain to be opened from either end in seconds, then when its time to close it back up it simply snaps back in place and the curtain tension is permanently set! The Rolling Post supports the roof and rolls in a channel next to the curtain rollers, so it is always attached to the trailer. Simply slide it out of your way for loading and unloading and slide back into place when finished. Swing type rear doors with standard hinges and lock rods. The superior design and quality workmanship of the SSI Curtainside ensure that your system will be durable and reliable for many years to come. Steel Formed angle kit: Our custom engineered kits can be shipped to your location for installation on existing units or newly built units.